The most well known Sherpa is probably Tenzing Norgay, who in 1953 summited Mount Everest with Sir Edmund Hillary. They were the first two men ever to stand on top of the world not long after Nepal opened its borders. On Friday, April 18th, 16 Sherpa guides were killed in an avalanche in the Khumbu Ice Fall, a crevasse field on Mount Everest’s 19,000 foot lower reaches. While there were five survivors, the accident will be remembered as the deadliest ever on Mount Everest. Sherpas are one of the primary ethnic groups in Nepal’s alpine region, and many make their living as climbing guides. The word Sherpa has become interchangeable with the powerful mountain guides necessary to reach the high peaks in the Himalayas. The economics are clear. A top Sherpa can earn up to $5K during the prime climbing season in the Himalayas. This is roughly 10 times the average annual wage in Nepal, where poverty levels are high. For these wages, the Sherpa takes on arguably the most dangerous profession of all. Wealthy westerners, often with little or no mountaineering experience, pay vast sums of money to be deposited at the top. It’s an extremely dangerous environment and has unfortunately become accessible as a form of recreational tourism. The triangle is connected by Nepal’s Ministry of Tourism which is motivated by ample access fees. Out of respect for those who died, the Sherpas are stepping back. There may be no Himalayan climbing season this year. 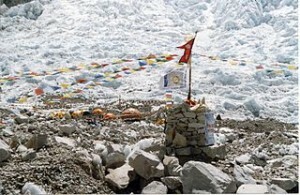 Sherpas, mostly Buddhists, worship the mountain and process death differently than westerners. While the Sherpas are the backbone of the Nepalese tourism industry they also are right to push back when sensitivity to their safety and wellbeing has derailed. Not dissimilar to their tiny country, the Sherpa’s independence is compromised.